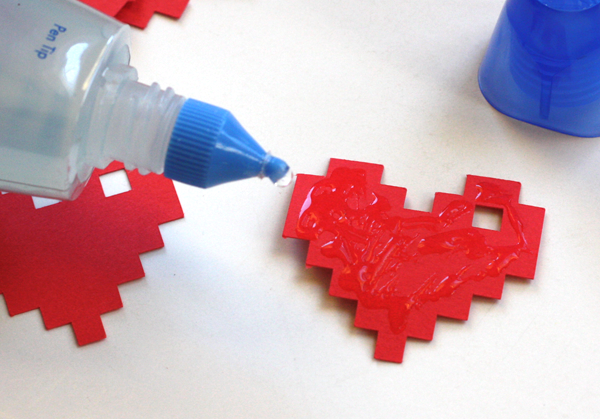 Need a last-minute DIY Valentine's Day gift? 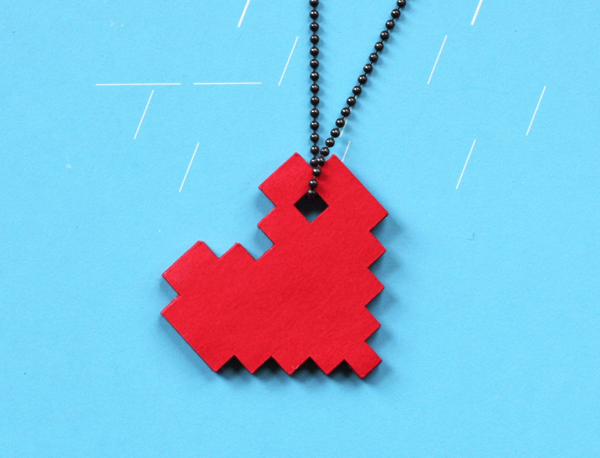 Show how much you care by using 50 cents' worth of paper and glue to make a pendant. I was inspired by all the pixel stuff at Pinterest lately. (Part of the 80s revival, perhaps?) And I was really impressed by a paper necklace Patricia Zapata was sporting at the Alt Design Summit recently. To make the pendant, cut 12 hearts from cardstock. You can download the PDF template here, print it at 100%, and cut out hearts very carefully with an X-acto knife. Or, if you have a Silhouette cutting machine, download the .studio file here and make your machine do the work. The template produces hearts that are 1.5" wide. 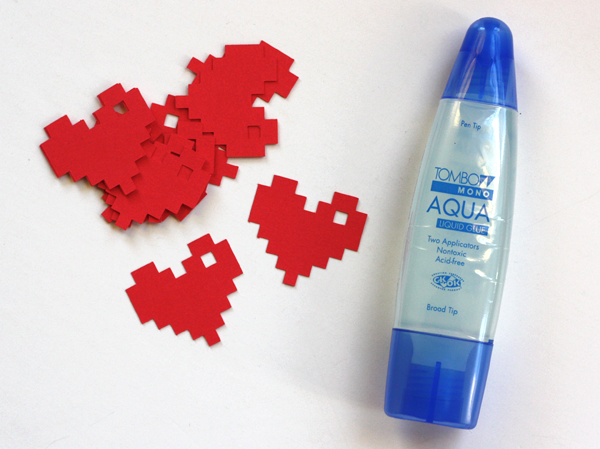 Glue the hearts into a stack, applying glue sparingly. Sometimes it's helpful to use the tip of the bottle to smear the glue around a bit. I used Mono Aqua clear glue from Office Max. As the glue dries, the pendant will harden nicely. If you wanted to seal it, you could brush on some hard coat Mod Podge or apply a coat of clear acrylic gel medium. Update: get more designs to make right here. Wonderful, I never knew that paper jewelry could look so stylish! Very cute! I was just gathering pixel inspiration for my next post. How timely! love it! agree about all the pixelated stuff around at the moment...very cool. Thank you so much for this post. I want to let you know that I posted a link to your blog in CBH Digital Scrapbooking Freebies, under the Page 4 post on Feb. 14, 2012. Thanks again. This is so cute! Thanks so much for the studio file. It makes me nostalgic for my Atari. Great stacking method! Thanks! Love the little pixel for the chain. Perfect placement. Very clever. adorable. i love how this turned out. LOVE! definitely making and sharing. reminds me a bit of the v-day card i made for my wife last year. i can say from experience if you don't have a cutting machine, these are a bit of a PITA to cut. I would recommend a blade with a wider angle, i can't remember the number, or a chisel style blade. You will snap the tip off a regular blade fairly fast. I have a craft robo pro and although i eventually got it to cut through my 120# paper, it took a lot of pressure and multiple passes. So the one photographed was cut by hand. Your card is great! Love it, thanks for sharing! 120#, eh? Hefty. I have become obsessed finding pixelated images I can do this with! Its so cute - mine is hanging on my work computer. Did you use smooth or textured cardstock? Love your project, so cute!! Where can I purchase these in large quantities? John, I think you're out of luck, since it's just a craft project for personal use. This is really cute! I love the simplicity of the design yet it look so cute! 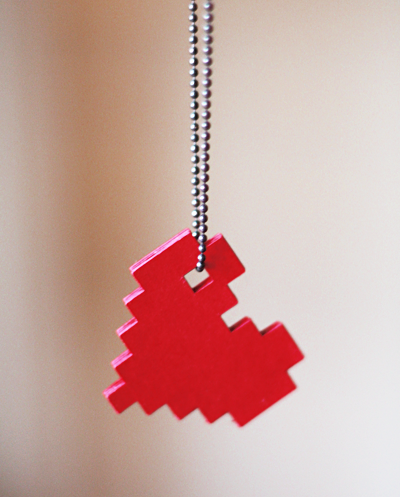 And the pixelized heart pendant is a creative idea! Thanks for this! You're welcome, and great idea! You took this photo on the back cover of How To Be A Graphic Designer without Losing Your Soul. what do I win?! LOUD APPLAUSE for figuring that out. Wow! Happy to hear it, Bailey!